No work today - it's Saturday. And we have no garden to sit out in. And it was a glorious day. 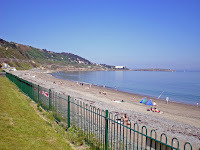 So, we went to Killiney beach for a few hours. PS - there are paw marks in the concrete foundation. I don't think it's Willow's, as we only allowed him out this morning, and I'd say the foundation was well set by then. After 6 hours of waiting, the concrete lorry finally arrived, after 6 pm. In fairness, he was due in around 4 - the lads had been quick in getting everything ready this morning, and had the steels in place before noon. So, they had a nice relaxing afternoon on the porch of the shomera at the back. But when 4 came and went, then 5, they were getting a bit annoyed, knowing that they would have a couple of hours' work to pour the concrete. It's now 20:15 and the concrete lorry man is washing the road (there is a power hose built-in to the lorry), which I guess means Stan and Fran are nearly done. Fran has been going back and forth with the little wheel-barrow thingy (a digger, but not for digging, it's got a big tilting bucket at the front), getting the concrete from the lorry and pouring it in our moat, while Stan is in the moat, in his wellies, and is shoveling the concrete down the moat to the end bit where the wheel-barrow thingy can't reach. A picture speaks a thousand words. I bet you wouldn't have known what a wheel-barrow thingy is without this picture! My heart goes out to these 2 guys - waiting all day, and then having to do such hard work so late on a bank holiday Friday. This picture shows the pipe spaghetti junction quite well. 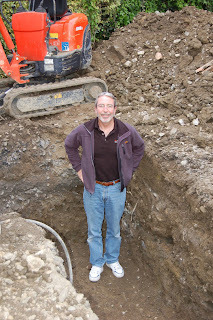 Today was the last day of digging. They dug out the last bit of the party wall's foundation with a jack-hammer. 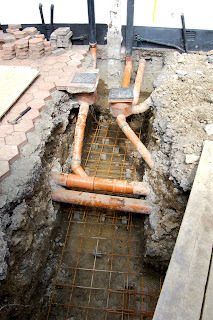 The engineer was over to give the OK for the pouring of the concrete. 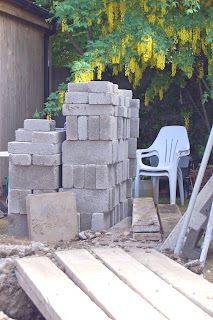 Tomorrow, weather permitting, the cement lorry will be outside our door and the foundation will be poured. A few blocks were brought on site today. No idea why, but they look pretty with our laburnum tree in the background, don't you think? Just to show how deep that hole is! Brendan is 6ft tall. Despite the forecast, the rain stayed off today. Fran and Stan (not David and Stan - got the names slightly wrong, there, didn't I?) worked all day, and were joined by David this afternoon (and that's how I know that Fran isn't David, if you know what I mean!). I've never seen men work so hard! As you can see, we have a lovely moat around our house now. Let's hope it doesn't rain tonight, or we could find ducks in there tomorrow! 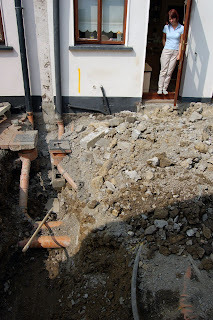 And there is more digging to do - the party wall foundation will need to be dug tomorrow, with a jack-hammer. 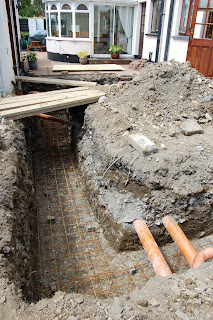 If all goes well, they will be able to pour the foundation on Friday, and it will settle over the weekend. PS - 4th skip is full. There is a 5th one coming in tomorrow morning. We must make sure to move the car tonight, or the skip man will see me in my pyjamas again! A lot of rain today. Despite the inclement weather, David and Stan worked all morning. They must have got completely soaked. 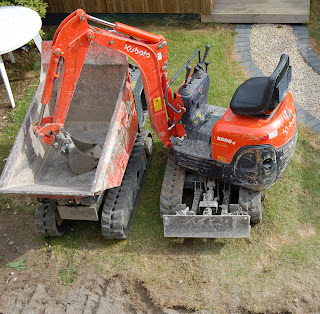 They've now left for the day, as the rain is slowly filling the holes in our garden! Hopefully the sun will shine tomorrow. PS: got a new skip again today! This is skip #4. 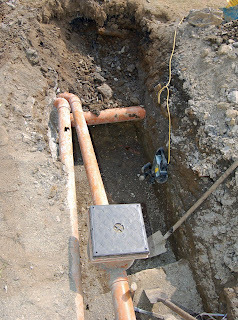 David and Stan have worked non-stop today, digging around all these pipes! 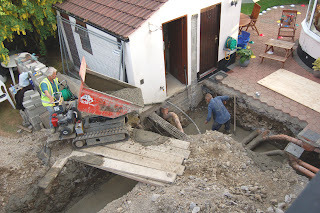 I never imagined that it would be such hard work, even with a digger and other power tools (I don't know the technical terms!). Skip # 3 is half full and there are piles of earth and rubble all around the garden. 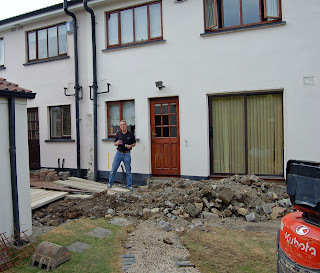 Kevin McGrath (that's our builder) and his team are certainly working hard. Let's hope the weather holds! The doorbell rings. I jump out of bed, put on my glasses and look out the window. 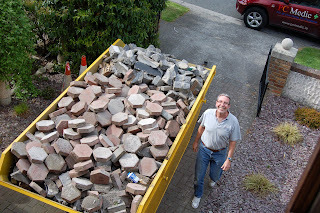 It's the skip man, delivering a new skip. I put on my yoga pants and run out to move the car, which is blocking the drive. And here is the result of my work - this is what I can do when I apply myself and when I follow instructions from experienced watercolourists! This is copied from Ferdinand Petrie's The Big Book of Painting Nature in Watercolor. And it also shows how quickly a good watercolour can be completed! No need to spend weeks adding layer after layer of mud! And Willow in the middle of all of this, you may be wondering? Well, Willow was quite distressed on the first day. The only place he found safe was the middle of the stairs. But since then, he's been doing well. He goes out first thing in the morning, and again after the builders have left, to inspect every new hole that's been dug. And he sleeps in a box or on our bed or on the sofa for the rest of the time. A few weeks ago, we moved his sleeping quarters to the front bedroom, in anticipation of this. So, he has a quiet room, which he can retreat to when the builders are around. His food is there too, and the water is in my bath. So, he won't be disturbed too much when the builders knock the kitchen wall through. One strange thing is that he has completely abandonned his seat downstairs since we moved it to a different corner of the sitting room. We only moved it one metre, but it's like that seat doesn't exist for him anymore. No work today. It's Saturday. But I wanted to say that Kevin's team left everything in excellent order for the weekend. 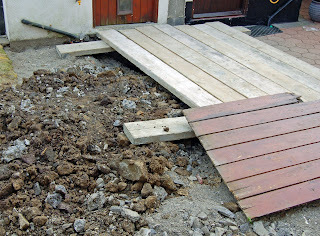 We had asked Kevin to make sure that the hole was covered and he offered to bring some barriers to keep the neighbours' kids safe. And he delivered - as a project manager, I know that these things don't happen on their own. Someone had to think about it, organise it, get materials in the right place and the right time, and give instructions for it to be done. Good work! I've finally found a method that works for dark clouds. White clouds are easy enough: lay a strong wash, and before it dries out, wipe out areas in which you want to have puffy white clouds. I've found that if you start wiping when the paint is still quite wet, you get lovely soft results, with different shades of white and blue as the paint seeps back in. But dark clouds have been a problem for me (see my last disastrous attempt). I finally found in one of my favourite books a way that works for me. 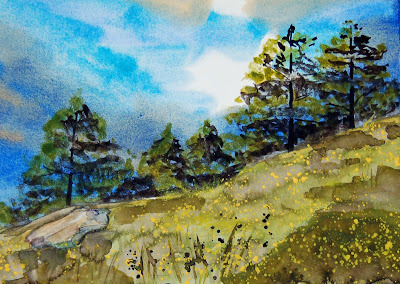 The book is The Big Book of Painting Nature in Watercolor, by Ferdinand Petrie and John Shaw. The trick is to dampen the paper with a sponge and then apply the paint quickly. I used to apply water with a brush, which tends to make the paper too wet, and paint would whirl around rather than diffuse slowly through the paper. So using a sponge makes the paper just damp enough. 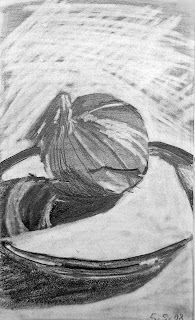 This picture here is my first attempt, following a step by step guide from the book (I'm only at Step 1, obviously). 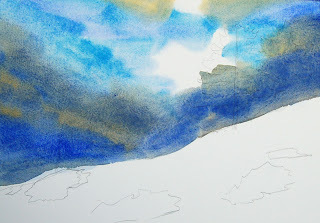 I've used ultramarine, burnt sienna, cerulean blue and yellow ochre, just like it says in the book. What do you think? The Hello Kitty parcel Véronique sent me finally arrived yesterday. I had a ball going through all the gorgeous bits and pieces - Christmas stocking, plasters, tissues, boxes, stickers, writing paper, paper folders, bin bags (Hello Kitty bin bags!!) and more. The little red bag is knitted - absolutely gorgeous! No Photos today - there was no work done today. Kevin, our builder texted Brendan this morning to say that it was going to rain all day so they wouldn't be on site. It was dry at that time, and it didn't start raining here until 3 this afternoon, so we're pretty pissed off. My guess is that he had to have his team on another job instead. Somehow, I would have preferred it if he had told us that! 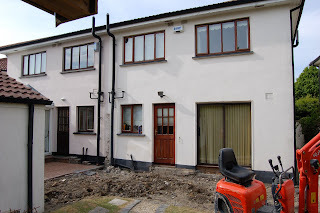 Maybe we're completely paranoid, and it was pouring rain in Co. Meath, but at such an early stage of the project, we don't know him that well, and we think of all the builder horror stories about. Hopefully, this is not a sign of things to come. We had such a good start, and we both had a good feeling about Kevin. He came highly recommended, and he's given us a very good impression so far. But if his team only work on our site 2 or 3 days a week, it's going to take a long time! The contract we have is for the job to be completed in 14 weeks, but Kevin told us last week he would hope to be done in 8 to 10 weeks. Hopefully it won't be more than that. Progress slower today. 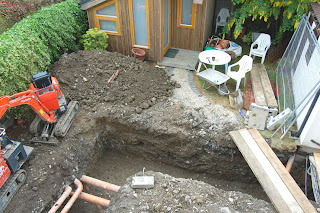 They have to dig carefully around all the pipes going from the back of the houses - waste pipe, gas pipe, heating pipe, and even some mains pipes going across the garden. That skip was filled between the hours of 10 and 5 today. Scary or what? I went to a customer for 3 hours, and when I came back, the wall between us and our neighbours was gone (it will be rebuilt at a later stage). And this one is for all you boys who like diggers! The builder's not starting until tomorrow! We thought he was starting on the 19th, but he had it in his head it was the 20th... Ah well! And this is the original photograph that inspired Nighfall at Uluru. Just to show that when I set my mind to it, I can achieve subtle effects in watercolours, though it's clear I struggle with producing vibrant colours! 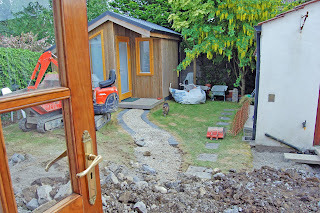 The builders are starting tomorrow, so here is a picture of the back of the house (with Cat on the table) as it is now. Not looking forward to the noise and dust! Not my best effort, but 10 times better than the first attempt I made. I like the colours around the sun, but the lines are too harsh. OK, time to continue with my 2 line-review of movies I've seen recently! Not that we've been to the pictures much. It's mostly videos and TV! K-Pax - With Kevin Spacey and Jeff Bridges. We'd seen a bit of it before, it must have been on a flight. Anyways, it was on the telly, and we watched it all. It's a bit intriguing (K-Pax is the planet where Kevin Spacey is from, or is it? He is in a mental asylum, and his psychiatrist doesn't know what to believe anymore), but it's got a strong heart of a story. Opal Dream - This is probably a movie we would not have noticed if we hadn't just been back from Australia. Opal Dream is the story of a family in the heart of Australia, a small place where opal mining is the main activity. The little girl has 2 imaginary friends, who disappear in a mining incident, and she is very upset. As she gets quite ill with grief, her older brother (who is about 10) sets out to help her and find out what happened to them. Blood Diamond - Leonardo DiCaprio has grown into a fine man and a fine actor. Even in this role, he still looks a little bit boyish, but what a performance. A gruesome story - the diamond trade and its links to the plight of children soldiers in Africa is not an easy subject, but this movie managed to tell the story with honesty while at the same time appealing to those who just want a good action move. Curse of the Golden Flower - A Chinese movie telling the story of an empress trying to fight off her emperor's plot to poison her. And the emperor's 3 sons' lives dominated by their father, and how they deal with it. Big production. Fabulous sets and costumes. And quite a few twists. Unlike a lot of the Chinese movies I've seen so far, this one doesn't have many Kung Fu type fighting scenes. Check out the website's photo gallery for a taste of the beautiful colours, costumes, sets and scenes. More to come... You'll have to wait. Dinner's ready! Right now, I'm listening to Keith Jarrett's The Koln Concert - one of my favourite pieces of music. As you know, I discovered it one day on the JK Ensemble on RTE Lyric FM. I rarely get to hear the show live on the radio (it's on Monday to Friday, between 2:30 and 4:40). Up to recently, they used to only have the previous day's show on the website, so I would only ever hear the Friday's program, as I only really catch up at the weekend. But they now post a full week's archive on the internet, so I get to hear a lot more of John Kelly's eclectic choice of music. I know that saying it's eclectic is not very original, but it really is - where else do you get to hear Keith Jarrett, Jacques Brel, Bach, Brian Eno and Sigur Ros in the same show? Did you know that only 3 countries in the world don't use the metric system - Liberia, Myanmar, and the United States of America? I read this in a very interesting article in Newsweek, by Fareed Zakaria. He is the editor of the International edition. I love his political analysis and writing. To me, he talks pure sense, and it is for his balanced view of America and the World that I read Newsweek. I hope they show his articles in the US edition too. I haven't reviewed movies in a while, so it's time to catch up!! I think the easiest thing is to ignore the bad movies and just talk about the good ones! The toughest thing would be to remember back to January, but I have kept a record of my life in this gorgeous little Hello Kitty diary that Véronique sent me, so I just need to flick back through colourful pages strewn with little birds, bees, flowers and Hello Kitties! War of the Worlds - I watched it. The cinematography was good, but I won't be watching it again. Tom Cruise is just not tall enough! Syriana - I reviewed this back in January, I think. One of the best movies I've seen. Hard to follow what's going on and who is who, but it makes you think about what makes the world go round (and it's not Love!). 300 - really bad. Don't waste your time watching this movie. Life is too short. Good Night and Good Luck - another George Clooney movie. Again, excellent. Wonderful to see men fighting for what's right and moral. No country for old men - this is the latest Cohen Brothers movie. A lot of blood, a lot of gruesome deaths, but very entertaining all the same. Darker than previous Cohen Brothers movies. Atonement - saw this one on the plane to Australia, so maybe not the best circumstances. While it was quite faithful to the book and it played out the different interpretations of the key scenes really cleverly, it didn't really work for me. I didn't like Keira Knightley in it - I felt she was holding herself too stiff throughout, with her elbows pulled back all the time. But the sound was really bad, so maybe I'm being unkind. A few really bad ones: Martian Child and Eye of the Dolphin, both seen on flights where there was no choice of movie channel, so we watched them, but it was painful! Juno - gorgeous, funny movie about teenage pregnancy. Michael Clayton - George Clooney at his best, and Tilda Swinton too. I've loved Tilda Swinton as an actress since Orlando (I can't believe that movie was made in 1992!). Plenty of intrigue, double dealing, and in the end, again, a very moral character at the centre of it all. Le scaphandre et le papillon - a French movie about the editor of Elle magazine, who suffers a major stroke and can only communicate by opening and closing his eyelid. I did cry at the end of this one. It's very beautiful and very sad, but shows the strength of the human spirit. A Fish Called Wanda - it was showing on the telly again, and I laughed as much this time as the last (in 1988). John Cleese, Michael Palin, Jamie Lee Curtis and Kevin Kline are hilarious. This brings us to the 13th of March. I've got as many movies to tell you about again, but that will be for another day. 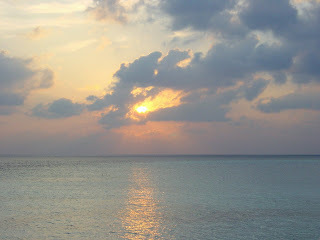 The next watercolour I'm planning to start (the paper is already stretched) is a Maldivian sunset, with plenty of gorgeous colours and dramatic clouds. I made an attempt already, which failed miserably - the colours bled into each other and it was a sorry mess. So, I'm a bit nervous about starting it again - I don't really know how to tackle it yet, and I know what happens when I don't have a plan! So, I'm stalling, keeping myself busy with lots of other things. You're going to see plenty of Australia/New Zealand-inspired paintings over the next while! This one is a view of the desert near Uluru, just after sunset. It took about 20 layers of watercolours to achieve the effect I wanted. I'm quite pleased with the result! Padraig is the only birthday this month, on the 29th. It's been a while since my last entry under the category of "The Wildlife of South Dublin". There isn't that much wildlife out here after all! On Thursday, Mary called me to say she was going to see the seals at Dun Laoghaire with Cormac on Friday morning and would Laura like to come along? Laura was delighted, of course, and we had a fantastic time! There were 5 or 6 seals hanging about at one of the jetties inside Dun Laoghaire harbour, where fishing boats bring their loot. The people in the fish shop at the end of the jetty were more than happy to give us a big bowl with fish bits (guts, heads, whole skeletons without the filets, and all sorts of gory things! ), and Cormac and Laura, after a slightly hesitant start, had a ball throwing these bits at the seals, who had their best meal of the day, I'd say. Besides feeding the seals, the kids had much fun opening and closing the mouths of monkfish and other strange fishes. A great day was had by all. Thank you, Mary! We made chocolate chip cookies on Thursday, me, Laura and my Mum. Laura, who is 10, had more experience than my Mum or me, who had never made cookies in our lives, and was able to give me a few tips (e.g., "if you have a fan oven, turn the heat down from 180 to 170", "put a few bits of chocolate on top before putting them in the oven"). The recipe was from Aine McAteer's book, of course, my culinary bible! It was a big success, particularly with Brendan. We used spelt flour and rice flour, and all healthy ingredients. The mix had a perfect consistency - it was easy to spoon it on the baking tray, where it settled nicely, and it lifted perfectly in the oven. Brendan is asking for more already!